OAKLAND, Calif. (KGO) -- Warriors guard Stephen Curry wore special shoes during the team's game Thursday night against the New York Knicks to honor the victims of the Ghost Ship fire. The shoes say "always remember" and have "Oakland strong" on them. They also have the initials of each of the 36 people killed in the warehouse fire earlier this month. 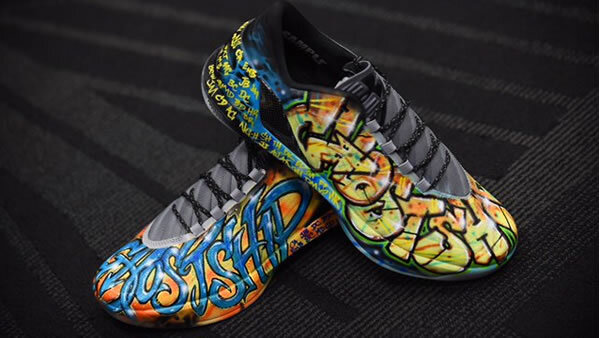 Curry plans to auction off the pair to benefit the families of the fire victims. Click here for full coverage on the Ghost Ship fire. Stephen Curry wore these shoes honoring the victims of the Ghost Ship fire during a Warriors game on Thursday, Dec. 15, 2016 in Oakland, Calif.